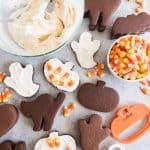 These Easy Chocolate Cut Out Sugar Cookies hold their shape and have great chocolatey, buttery flavor that is perfect with either royal icing or a regular buttercream frosting. Great for Halloween, Valentine's Day, or anytime! In the bowl of a stand mixer, beat the butter on medium speed using the paddle attachment for 1 minute until creamy and smooth. Add the sugar and beat for 2 to 3 minutes, until light and fluffy. Beat in the egg and vanilla on high speed, scraping down the sides of the bowl as needed. In a separate bowl, whisk together the flour, cocoa, baking powder and salt, then add to the wet ingredients and mix together on low speed until combined. Divide the dough in half and shape into discs. Wrap tightly in plastic wrap and refrigerate for at least 1 hour and up to 2 days. When ready to bake, heat the oven to 350 degrees. Line 2 baking sheets with parchment paper and take the cookie dough out of the fridge to sit on the counter for 10 minutes before rolling. Working with one disc of dough at a time, roll out between two sheets of parchment paper to between 1/4" and 3/8" thickness, then cut out with cookie cutters and place on the parchment lined baking sheets. Bake for 10 minutes, rotating halfway through bake time. The cookies will still look soft, but do not overbake. Cool on the baking sheets for 5 minutes before transferring to a wire rack. Cool completely before frosting and decorating.